Busy mom's blog for easy and chic knits: I am an ebay seller! I am an ebay seller! 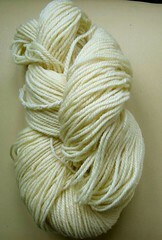 Just one week before my trip to Romania I posted 2 skeins of 100% ORGANIC wool for sale on ebay. The yarn is just perfect for hand dying and/or felting. I was surprise to see how quickly it had been sold. Today I posted some more (5 skeins). For those who are interested in this yummy and soft yarn, click here. I tried myself this yarn. It knits easy and it felts beautifully. I hand painted with natural paints and it works wonderful too. One hank has 186 meters/203 yards.